Block USA veteran and CarbonCure Technologies’ Bill Holden (left) oversaw NCMA Hall of Fame inauguration. Here he joins Karl Watson, Sr. and Troy Maschmeyer (right). A past competitor, Maschmeyer Concrete Company of Florida CEO Troy Maschmeyer, introduced Watson, longtime president of West Palm Beach-based Rinker Materials Co. and Marshall E. “Doc” Rinker deputy. NCMA credits Watson’s role in proving how concrete block could be mass produced and delivered in a complementary manner with ready mixed concrete, while working with his boss to strategically site plants across the Sunshine State. “Karl was a strong advocate for the role that associations could play in creating and advancing markets [and] an ardent supporter of his employees participating at NCMA and serving in leadership roles,” NCMA affirms. Addressing the NCMA business meeting, Watson traced his construction materials career to 1965, when he joined south Florida’s Shirley Bros. prior to the lengthy tenure at Rinker Materials. There he played a major role in expanding the franchise on its Florida home turf, then across the Southeast and Sunbelt, and into the Pacific Northwest. Just ahead of the 2007 takeover by Cemex S.A.B. 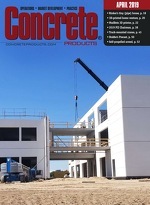 de C.V., Watson noted, the Rinker Florida operations closed a housing boom peak year shipping 200 million-plus concrete masonry units from a plant network encompassing 30 machines. Family and colleagues on hand for the NCMA Hall of Fame recognition included Karl Watson, Jr., who after leading Cemex USA has transitioned to chief operating officer of Summit Materials Inc., Denver. Brampton Brick CEO Dave Carter introduced his Ontario peer Gordon as the first Canadian in the NCMA Hall of Fame. Gordon was recognized for industry contributions through Atlas Block, the first North American concrete masonry producer to issue an Environmental Product Declaration for CMU, and Nova Scotia-based CarbonCure Technologies; and, serving as the first NCMA chairman (2011) from Canada.